The songs page is a master list of all the songs in your repertoire. Songs will be the first view that appears when you open the app. If you are not on that page open the main menu of the app and tap Songs. Tap the plus button at the top of the Songs page (#1). This will open the “Edit Song” page shown below. Fill in all the data you require on this page. 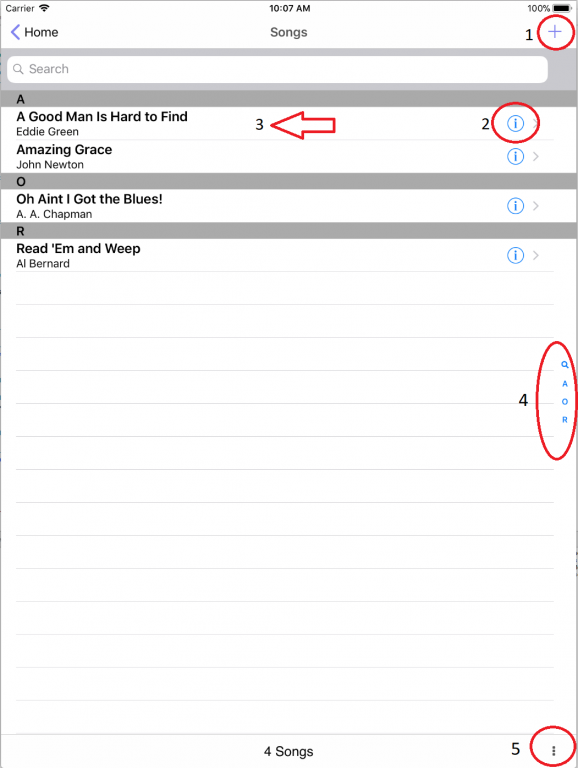 To edit the song attributes to an existing song tap the information button show in (#2). Swipe the song in the songs list right to left with one finger (#3).When you do this the “Delete” button will appear as shown below. Tap that button and song will be deleted. If a song is deleted and the song is contained in setlist, the song won’t be deleted permanently. The song with be marked as deleted so it won’t ever be shown on the song list but it will still be in the setlist. On the right side of the screen, you will see the first letter of the song in alphabetical order. Tap your finger over the characters on the right that you want to navigate to. The view will scroll to the character you stopped on. The songs page will contain the song count of all the songs in the list. Print – This will allow you to print your song list. Share – This allows you to send your song list. Share uses the iOS share menu. This will let you Email, Copy, or use any app that is registered with the share menu.